No matter where you go camping, the cold can sneak up on you. Not being able to sleep because you’re shivering is the worst, and a camper that doesn’t sleep well is not a happy camper. The most common solution to heat the camper is by turning on the furnace. The furnace does a good job at heating the whole trailer by using propane and some electricity to run the fan. But why are you wasting propane to heat the entire trailer if you’re only staying in bed? Same if you’re using a Mr. Buddy heater. A smarter thing to do would be to buy a heated blanket that heats a smaller area, the area where you are. But wait, you might say, I am using a space heater. Space heaters are great for heating the whole trailer too, but they use a lot of power. Often over 1000 Watts. If you’re boondocking and running on solar or using a generator, it will use a lot of battery power or gasoline. The heated blankets we’re looking at today use much less energy, most under 300 Watts. And then there is the scenario when you’re at a campground and have unlimited power, but then you might be next to a husband/wife that complains about you keeping the trailer too warm and sweaty. In that case, a heated blanket can keep you warm and nobody else. Have I convinced you yet? Well if you’re here, you’re probably already looking for one, so let’s get to it. Today I am taking a look at five heated blankets and one heated mattress pad for camper queens. The first blanket in today’s comparison is a throw blanket that is 50 x 60 inches and weighs less than three pounds. Sunbeam has made this blanket out of 100-percent polyester, and it comes in seven different colors. This is a blanket that’s small and portable enough to where you can wrap yourself up on the couch with it and not only put it on your bed. With three heat levels, you can decide how warm you want it to be, and the 3-hour auto-off function will make sure you don’t leave it turned on for too long. 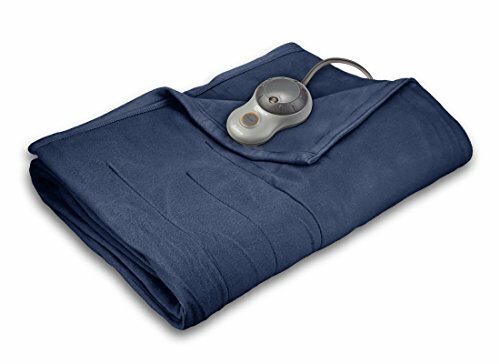 The Sunbeam Fleece Heated Electric Throw Blanket is machine-washable and dryer-safe. Sunbeam advertises this blanket as extra soft with 2 mm plushness. Although rated for 180 Watts, the blanket only draws 60 Watts on all heat settings. In the end, this throw blanket sticks out with its lightweight and low wattage use. It’s not as big as the others, but that makes it more portable and easier to use as a regular blanket on the couch or in the car. Having only three heat levels can be both a pro and a con, but for me, it’s a big pro as I don’t need more than three levels to choose from. Of course, it depends on the user. Next up is another blanket from Sunbeam. This one comes in four different sizes: Twin, Full, Queen and King. You have eight different colors to choose from, though not all are available in all sizes. It’s made with 100-percent polyester and has a quilted channel design. The blanket is both machine-washable and dryer-safe. The queen size comes with dual controllers, where each side uses 180 Watts of power. This is an excellent option for if you don’t always want to run both sides warm or want to keep them at different heat levels. The controllers offer ten heat settings with a 10-hour auto-off function for safety. The functionality I am missing is a programmable auto-off function. Ten hours is a long time to leave it on if you’re sleeping. Sunbeam advertises the Sunbeam Quilted Fleece Heated Blanket Queen as extra soft with 2 mm plushness. The polyester will be soft enough to put this blanket in the bed. Where this blanket sticks out for me is with its nice looking quilted design. I can’t look at it and say that it looks like a heated blanket as with many other products, this looks like something I could leave on the bed for its style. One of the most power-usage friendly blankets in today’s comparison is from MaxKare. The large full-size blanket only uses 105 Watts. It still does a good job as a heated blanket with its three heating levels that has a range of 90-107℉ and can heat up within five minutes. The auto-off function turns the blanket off after eight hours for safety. 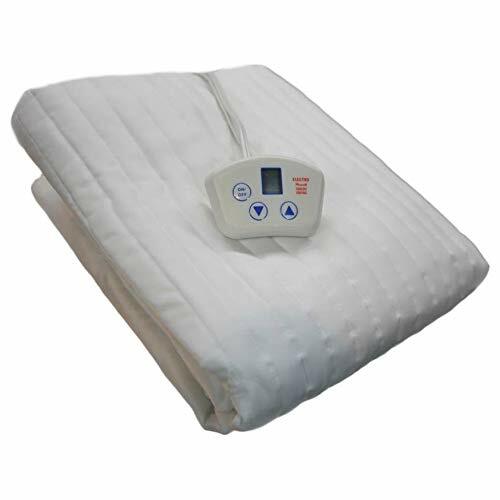 The MaxKare Large Electric Heated Blanket Full Size is made out of flannel and comes in three different sizes, throw, twin and full size. After removing the controller, you can safely wash this blanket in a washing machine, but it’s not dryer-safe. I like the ease of use and the modern-looking controller that comes with this blanket. Although the full size only has one controller, the low wattage and the ETL certification with overheat protection makes this a worthy contender for the best heated blanket for the RV’er. I also like that there are only three heat levels. The company Perfect Fit makes this model called SoftHeat that is available in four sizes: Twin, Full, Queen and King. The queen and king models come with dual controllers where each side uses approximately 75 watts. The blanket is made out of micro-fleece and thinner, more flexible wires compared to traditional warming wires. What makes this heated blanket different compared to other blankets is the fact that it runs at low voltage. Where standard blankets run at 120 volts, Perfect Fit advertises that the SoftHeat runs at less than 25 volts. This was done to provide protection and safety even if the blanket would get wet. You will get ten heat settings and a 10-hour auto-off function on each controller. The SoftHeat by Perfect Fit Low-Voltage Queen can be washed in warm water and tumble dry on a low setting. What I am missing from the SoftHeat (as with many other blankets) is a programmable auto-off feature. As it is now, you have to buy a timer to plug this into if you want the blanket to only stay on for an hour or two until you’ve fallen asleep. Next up on the list is a set that comes with both a throw and a heated fleece blanket. You have four sizes to choose from: Twin, Full, Queen and King. The throw blanket stays the same size in each set at 50 x 60 inches. The throw blanket has three heat levels, and the heated blanket (queen and king models) have two controllers with five heat levels on each. For safety, the throw blanket has a 2-hour auto-off function, and the bigger blanket has a programmable 1-10 hours auto-off. Both are UL/ETL certified. Each side of the big blanket uses 160 Watts at the highest setting, and the throw uses up to 160 Watts. Finally, there is a blanket in today’s comparison with a programmable auto-off function. I like the fact that the user gets to decide how many hours it should stay on before automatically turning off. Beautyrest recommends hand washing the blankets, or machine wash on a slow agitation cycle with cold or lukewarm water. You can also tumble dry the blankets on low heat. The Beautyrest Heated Fleece Queen Blanket and Throw Combo Set is my favorite product in today’s comparison for two reasons. It comes with both a throw and a big blanket, and it has a programmable auto-off function on the big one. I don’t like that it draws 160 Watts on each side, but since I could have it turn off after an hour when I have fallen asleep, it would still use less power than a lower wattage one that doesn’t turn off automatically for 10 hours. Last but not least is this heated mattress pad from Electrowarmth. It comes in several sizes, but the one I am looking at is the short queen with dual control. Most campers come with short queen beds (also called camping queen), but depending on what you have you can choose your size. What’s impressive with this product is the low wattage use. It only uses 126 Watts at most with both controllers on. Each controller has ten heat levels, and for safety they both turn off after 10 hours of use. Once again, I am missing a programmable auto-off function that lets me decide how many hours it should stay on until automatically turning off. The Electrowarmth M60Fd Short Queen Dual 2 Controls Heated Mattress Pad is a product I can imagine having installed permanently in my trailer due to the ease of use and low wattage. I don’t like the look of the outdated controllers, but the functionality of a great heated mattress is there which is why I still recommend it. After looking at five heating blankets and one heating pad, I’ve realized that this is a product category where it comes down to preference. Do you want to be able to choose between ten heat levels, or is it more important that you can program when the blanket should turn off automatically? Do you need a blanket that covers the whole bed, just your side, or just your feet? No matter what your answer is to these questions, I hope that you’ve found what you’re looking for by now. 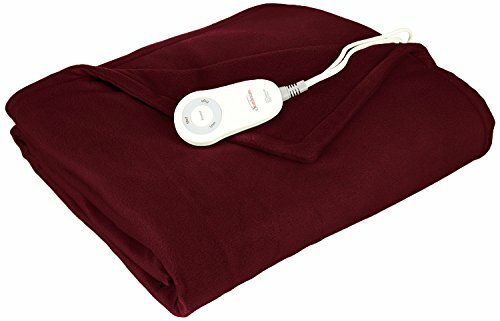 A heated throw blanket: Sunbeam Fleece Heated Electric Throw Blanket – This throw blanket from Sunbeam can be used in a lot of different places due to its weight and size. Wrap yourself up on the couch, in the car, or on the bed with this, and it might be the only heated blanket you’ll ever need. Three heat levels to choose from with an auto-off after three hours. Low wattage and made out of soft polyester, this is enough for most people. 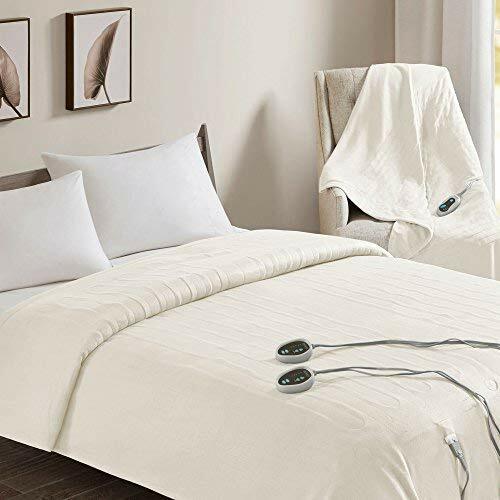 A heated blanket for the bed: Beautyrest Heated Fleece Queen Blanket and Throw Combo Set – Buy this, and you get both a throw blanket and a bigger blanket for your bed with this set from Beautyrest. The throw blanket offers three heat levels with a 2-hour auto-off, and the bigger one offers five heat levels with a programmable 1-10 hour auto-off to let you decide how long the blanket should stay warm after you’ve fallen asleep. 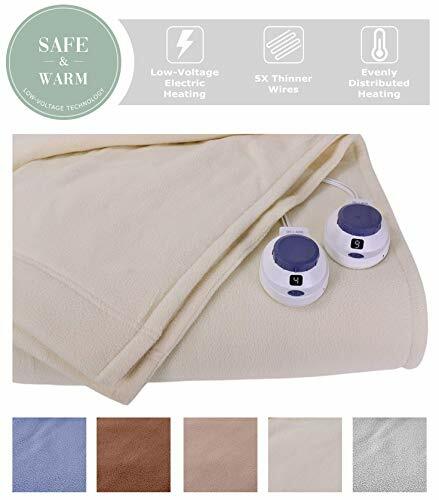 A heated mattress pad: Electrowarmth M60Fd Short Queen Dual 2 Controls Heated Mattress Pad – This heated mattress pad from Electrowarmth runs on low wattage with ten heat levels and 10-hour auto-off and will always be there for when you need it. Leave it on the bed at all times, and you don’t have to mess around with a blanket on top. Why should I get a heated blanket instead of running the furnace? To save propane and energy. It takes some electricity to run the fan in your furnace. I believe it’s smarter to heat the area you’re at instead of heating the whole house or trailer. As with all electronics, especially ones related to heating, you should be very careful and follow the recommended guidelines. If your blanket has cracked or is worn, you should throw it away. Even if your 10-year-old blanket hasn’t broken, you should throw it away as old blankets account for 99 percent of all heated blanket fires. I recommend buying a heating blanket that has been UL certified which indicates that the product has been safety tested. The most important thing to do when you’ve got a heated blanket is never to leave it on when you’re not there. What are the benefits of using a heated blanket in a residential home? If you can stay warm by turning on a heated blanket instead of heating the whole house, you’ll quickly start saving money. Heating bills are high in the winter months and can be reduced by heating the house less and dressing warmer, or using a heater blanket.